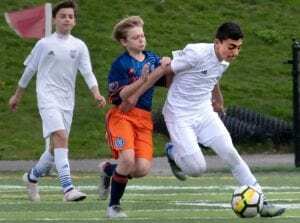 Beachside Soccer club is very pleased to Congratulate Gianluca Armellino on being selected to play for MLS’ club Kansas City Sporting’s Academy. Gianluca has been at Beachside the last 3 years and currently a standout player on the U13 Development Academy team. In anticipation of his family’s move to the KC area over the summer, Beachside made contact with KC Sporting and arranged for him and train with them for week earlier this year. “Gianluca is a very talented player, and from the Fall to this Spring he has shown tremendous progress. Our club has relationships with many MLS academies throughout the United States and we will always do what is right for the player when we feel the time is right. In Gianluca’s case time will tell but, with his talent, maturity and passion for the sport, I see no limits to how far he can progress. I am very pleased for him and we wish him and his family the very best”, said Beachside Technical Director Mickey Kydes. Gialiuca’s move to KC sporting was the first MLS academy move initiated by Beachside with cooperation of KC Sporting and the Armellino Family, Beachside will continue to be proactive and support these opportunities for players that demonstrate that potential & desire.